Cool kids deserve a cool sweat. Which is why our Cool Sweats Trackie covers all bases. Not only is it super comfy and cosy, it also features cool sporty styling including Bonds branding and placement stripes. Your little sport will totally look the part in this varsity-style sweat. Material: Main: Cotton / Nylon; Contrast: Cotton / Elastane (Exclusive Of Trims). 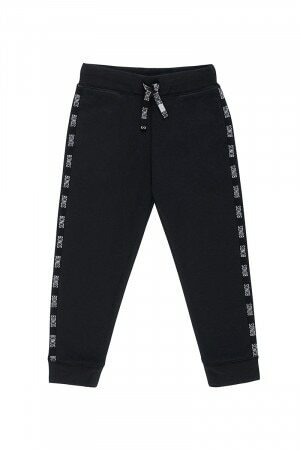 Kids Cool Sweat Trackie is rated 4.6 out of 5 by 16. Rated 1 out of 5 by KarenB from Ankle freezers (short), have not washed/ worn well Bought these at the start of winter for my son who is a size 4/5. They are so short in the legs - my son complains about being cold because these pants are genuine ankle freezers. Also, they have no washed/worn well at all - they already look trashed after a month or two. For the price you'd be better off buying 3 x discount department store pairs. Very disappointed. Rated 4 out of 5 by Mjfirus from Love the material Very happy with the quality, but maybe prices could have been better. Rated 5 out of 5 by Panomy from Fantastic purchased Love the sale plus extra sale off allowed me to grab a real bargain for great pants. The material is nice, soft and warm. Definitely will buy again when there is great sale come up. The free shipping and return also allows me to purchase without worry. Thanks Bond! Rated 5 out of 5 by mummabear2 from Comfort levels 100 Purchased these trackies for my son who has said he just “loves” them! They are made from great material and wash well! Stoked with the purchase, have brought 4 more in other colours and up one size since for the rest of winter! Rated 5 out of 5 by Reba1976 from Fits well I bought 2 pairs of Kids Cool Sweat Trackie’s about a month ago and my little man loves them.. They are so soft and comfy and fir him perfectly, with lots of room to grow.. Rated 5 out of 5 by Nicola J from Super soft I love a good quality tracky. These super soft tracksuit pants are going to be so warm in winter, perfect for the kids to wear for play time and to stay warm. Rated 5 out of 5 by Mommy from Love these I bought these in sizes 5, 6 and 7 as my boy absolutely loves them. Perfect for kinder and the park, they're super comfortable. Rated 5 out of 5 by Tanhat from Cool look I purchased this a few weeks ago and I find them to be very versatile and have made especially for boisterous little boys!